Through a review of specific patents and specific patent claims, the terms “patent quality” and “patent value” are clearly defined and illustrated. The book is oriented for busy corporate and legal professionals – it enables the reader to obtain the maximum benefit for the time invested. Chapters 1 – 2. Introduction: Basic information about patents, and also the main techniques used by professional evaluators to review the quality of patents. Chapters 3 – 7. Quality and Value: 20 case studies with more than 50 patents. 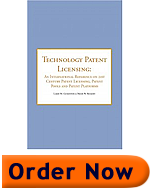 Each case study ends with a concise statement of “Lessons Learned” about the quality of patents or patent portfolios. Every patent included in the book has been very successful in some way, either by winning large sums of money in litigation, sale for significant sums, entry into the patent pool of a major technology, or repeated reference by other technology companies. Chapter 8 and Glossary: Summary. The essentials of “good patents” are presented in a very easy-to-understand Question & Answer format. The book concludes with a Glossary of more than 80 terms used in the evaluation of patents and patent portfolios. 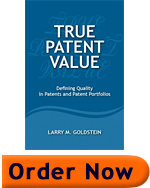 TRUE PATENT VALUE has been called by one patent litigator “an extremely useful resource for patent attorneys and agents of all levels of experience, and for anyone else wishing to understand what makes patents good and valuable” (Gary A. Hecht, Partner at Fox Rothchild LLP, Philadelphia). It has been described by the founder of the W-CDMA patent pool as “a systematic and objective framework for assessing patent quality and value…The book explains major ideas in a clear and user-friendly way” (Brian N. Kearsey, Founder of the W-CDMA patent pool, London). Specific guidelines for creating a patent pool. This book was reviewed in les Nouvelles, the Journal of the Licensing Executives Society International (LESI), March, 2005, where it was called “a highly useful tool” for creators, licensors, and licensees of technology subject to a technical standard. It was called a “most excellent book” in the article, “Royalty Rates and Licensing Strategies for Essential Patents on LTE (4G) Telecommunication Standards”, printed in les Nouvelles, September, 2010.